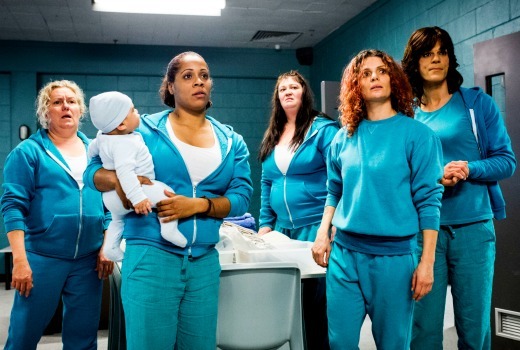 Wentworth fans ….get ready for change. Now filmed at a new location in western Melbourne, and helmed by a new Series Producer in Pino Amenta, there are changes on screen and behind the scenes. Amenta is a seasoned director, having helmed Wentworth, and a lengthy array of credits including 800 Words, Packed to the Rafters, City Homicide, Always Greener, Blue Heelers, The Flying Doctors, All Together Now, The Sullivans, ANZACs, Sons and Daughters, All the Rivers Run and more. Now turning his hand to Producing at the request of FremantleMedia, he knows it’s time to kick things up a level. “I said to the guys at the start we really have to keep climbing. I know how hard it is having done stuff for Seven and Crawfords, you can get to a point where you’re hanging in there,” he tells TV Tonight. It underpins his series plan for Wentworth, to not rest on its many laurels and to raise the stakes for its characters. “There’s a responsibility not just to match what you had, but also to go up a notch. Every season you do it gets harder. “Ferguson (Pamela Rabe) will go up another notch. Vera’s (Kate Atkinson) gone up, Will’s (Robbie Magasiva) gone up and Bea (Danielle Cormack) has a whole different journey. Amenta turned back to Bea Smith’s background before her incarceration for a story arc that will play out across the series. After having been sentenced to life without parole, the writers will address her future behind bars. “All her friends have 4 years, 6 years, 8 years –so they have hope. But put yourself in her shoes. So she’s there –but does she want to do this (top dog) job? Or does she want to die? What’s to live for?” he explained. “So she’s erratic, all over the place. Partly-suicidal at times. The trailer for Season 4 shows a fallen Joan Ferguson (Pamela Rabe) displaced from governor providing plenty of story possibilities. “Her quest is really quite clear: she has to prove her supposed innocence. Pam’s really good, she’s done all this research on psychopaths,” said Amenta. “Ferguson believes she’s innocent. Clearly she’s not, but that’s in her mind. Much-loved bad girl Frankie (Nicole da Silva) is also back, but no longer behind bars. New cast members this season include Kate Jenkinson, Bernard Curry and Sigrid Thornton as Sonia Stevens. Thornton becomes the first former Prisoner original to appear in a major role in Wentworth. Referring to the Stevens character, originally played by Tina Bursill, Amenta said there are reworked elements from the original Prisoner role. “You might bring them back as a version, or shadow of them,” he explained. Fans may have to pace themselves. Not all the new changes will appear from episode one. Wentworth returns 8:30pm Tuesday May 10 on SoHo. I hope kicking things up a notch isn’t the same as jumping the shark. Based on episode 1, it has not.